Keywords: MDA, MDE, CIM to PIM Transformation, Business Process Modelling, Computer Modelling. on creation of the transformable models in CIM level to facilitate the transformation task to the PIM level. on UML to model the PIM level, because UML is advisable by MDA in PIM. recommends the use of some standards. information of the target platform. Rhazali, Y., Hadi, Y. and Mouloudi, A. A New Methodology CIM to PIM Transformation Resulting from an Analytical Survey. requirement elements as a first step in PIM level. a final step of the PIM level. simplify the transformation from CIM to PIM. 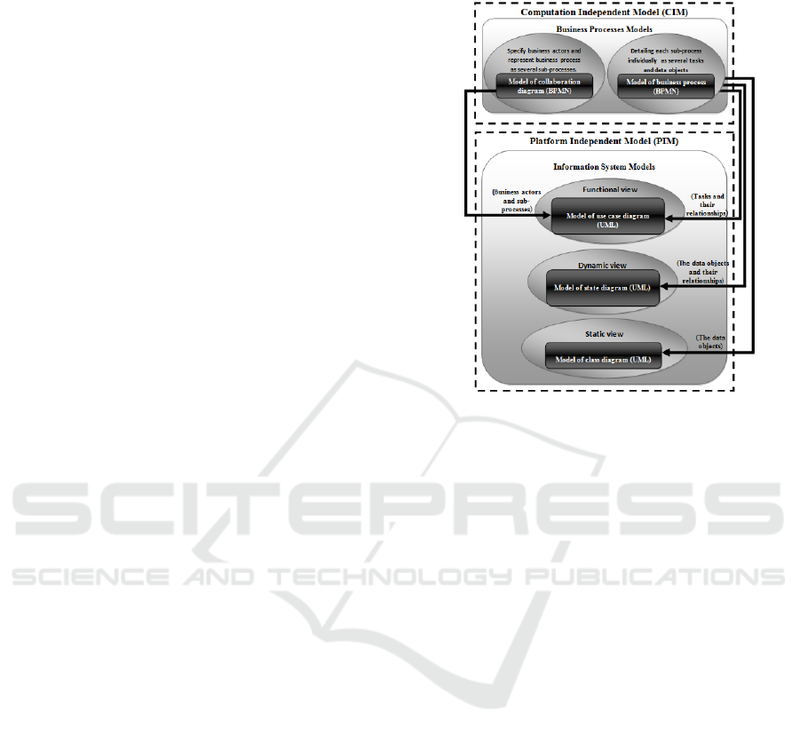 diagram, use case diagram, and domain model. using the i* modelling framework (Yu, 1997). PIM that is represented by data warehouse design. model and class diagram model. PIM level is represented by (Bousetta et al., 2013). and business rules and objects. a semi-automatic transformation from use cases. transformation rules for moving from CIM to PIM. 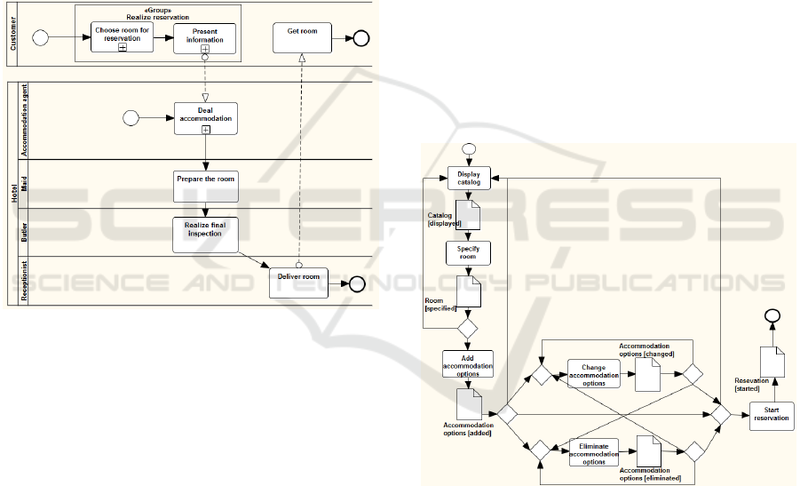 activity diagram for modeling the business process. to PIM through a semi-automatic transformation. activity diagram to model business process. Figure 1: Scheme of our proposal. development of quality information system. automatic transformation from CIM models (Fig. 1). transformable elements (actor, task, gatway…). already described with OCL language. shifting BPMN models to class diagram model. verifies the quality of the room. process through the BPMN collaboration diagram. Figure 5: BPMN collaboration diagram model. show an object node with its state. The (Fig. 7) presents the use case diagram model. for reservation” becomes a package of use cases. functionalities and not on their logical sequences. Figure 6: BPMN business process diagram model. "displayed" transformed to state "catalog displayed"
exclusive fork & join node. 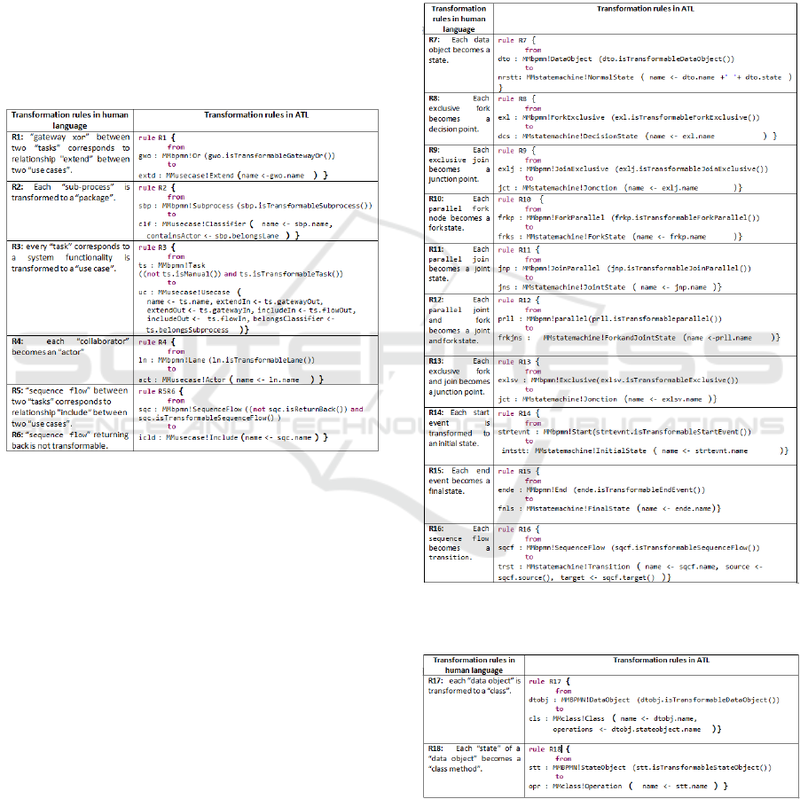 The establishment of class diagram model (Fig. 9) represents the ultimate objective of the PIM level. Figure 7: Use case diagram model. Figure 8: State diagram model. Figure 9: Class diagram model. BPMN to model business process. static view is shown by the class diagram model. the code does not readily results by transformation. Our approach covers the three modelling views. languages are the most effective. al., 2007; Gutiérrez et al., 2008). which allows ensuring a model transformation. approach is approved in practice through Eclipse. Blanc, X., 2005. MDA in action, Ed. Eyrolles. 1st edition. Applications, vol. 3, no. 2, pp. 1-21.
Business Process Specification Schema Version 1.01. Fort Collins, CO, USA, October 1999, Springer. organizational sciences, vol. 34, pp. 89-99. Kherraf, S., Lefebvre, É., Suryn, W., 2008. Applications, vol. 4, no. 4, pp. 616-625. Virtual Conference Slovakia, pp. 71–74. 2011, V1.0. OMG Document – formal/2011-01-01. 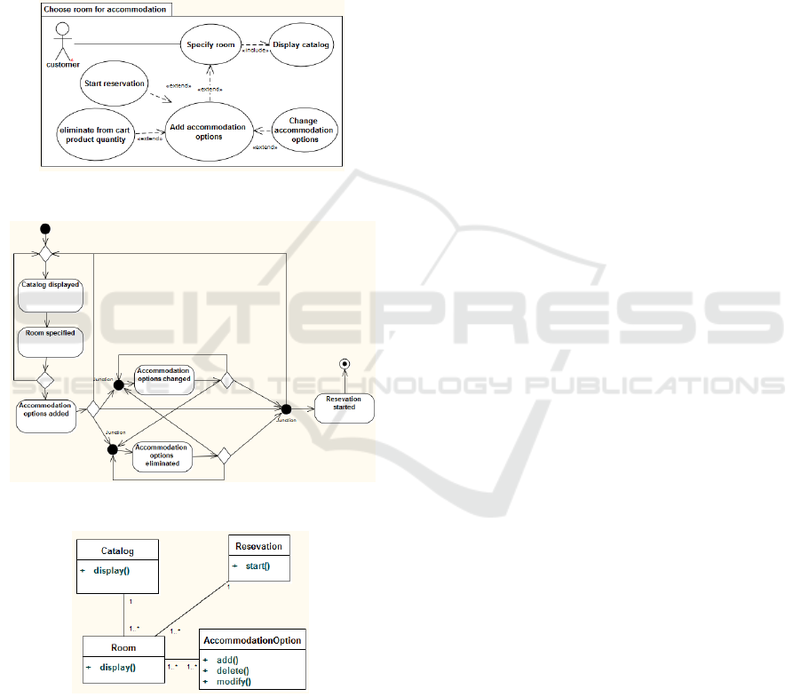 UML Profile and Metamodel for Services (UPMS). 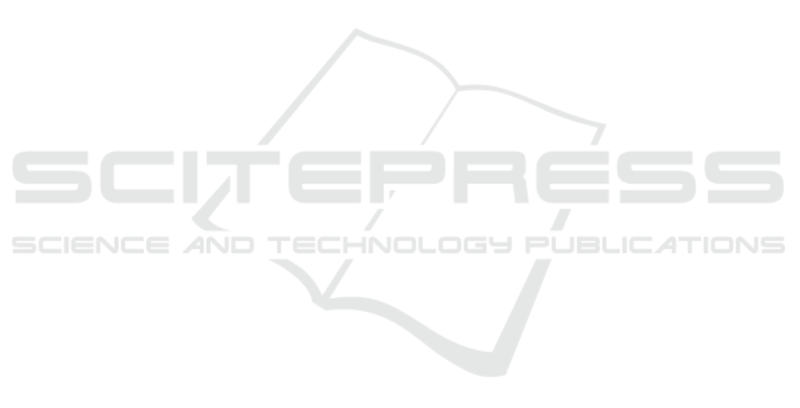 Publishing Company. Beijing, 1st edition. Development, Angers, France, pp. 312 - 320. Open Source Software Computing, Amman, Jordan. Rodríguez, A., Fernández-Medina, E., Piattini, M., 2007. Rodríguez, A., Fernández-Medina, E., Piattini, M., 2008. Springer Berlin / Heidelberg, strany 1239-1249. Examples and Solutions, Wiley. 1st edition. European Conference on Information Systems (pp.